We should probably cut to the chase, start at the end, the conclusion. The new Nightwish album, Endless Forms Most Beautiful is pretty darn terrific. But you might be asking, Is it as good as Imaginaerum? That album was epic, the proper definition of "epic" symphonic power metal, and it presents some rather large shoes to fill. So the answer is probably, not entirely. But Endless Forms Most Beautiful still offers equally interesting and entertaining material. We should also dispense with the lead vocalist matters first. Flor Jansen (Revamp, After Forever) has been in the Nightwish camp since 2012. I've always liked her voice, simply because she doesn't have the piercing, even screeching, tone of other operatic singers. Jansen seems more balanced, offering focused range in her presentation. Like other albums there's a theme to Endless Forms Most Beautiful. The springboard is Darwin's evolutionary theory expressed in The Origin of Species. Founder and main composer Tuomas Holopainen uses the lyrics and music to express and celebrate the ideas of evolution, science, and reason as it pertains to the origins and unity of the earth and mankind. However, oddly, Holopainen believes that the unity of mankind comes from our origins in bacteria: "...all living beings on earth are related with each other, own a common origin as bacteria and that�s why everybody is on the same level." Well, okay then. Seriously? He's probably been reading too much of that atheist blowhard Richard Dawkins. Speaking of Dawkins, Nightwish enlisted the famous English biologist and god-denier to narrate portions of the album. He's heard at the beginning within Shudder Before The Beautiful, yet largely the closing piece Greatest Show On Earth. The title comes from Dawkins' book of the same name where he sets forth his evidence for evolution. Concerning the music, that song is probably a good place to start. (Though you may want listen Holopainen's song by song description below rather than read my dribble.) Greatest Show On Earth is the longest Nightwish song, ever, nearly 24 minutes. I had to listen to it twice to take hold of what was happening. Outside of the narration, in the five parts, it's largely an orchestral piece at the start and end, with more symphonic metal in the middle. Frankly I liked the former parts, rather than the latter; though classic Nightwish, the metal seemed generic. While a fine song, it wasn't my favorite. As for the other songs, they're quite varied. You get the large, bombastic, canvas with Shudder Before The Beautiful and Endless Forms Most Beautiful. 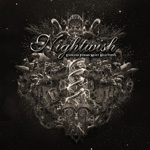 This is the Nightwish you know and love: breathtaking arrangements paired with massive orchestration and beautiful vocals. Similar in tone are Weak Fantasy and Yours Is An Empty Hope, but within these the riffage brings the enormity and power to the song. There are some lighter moments within as well. Notable is My Walden were light piano and folk tones counter the symphonic side. Elan once more shows how deft Holopainen is at dialing back on his natural inclination to create immense. The song is soaked in melody, turns on a rock groove and catchy refrain, even while the orchestration rolls on. Perhaps the most intriguing and inspiring piece here is the instrumental The Eyes of Sharbat Gula. Here Holopainen tried to capture in music, the expression and emotion of Steve McCurry's Afghan Girl (from the 1985 National Geographic magazine cover) and how he himself felt when looking at her picture. Frankly, it's one of his best compositions: delicate, stirring, captivating. As whole, and said at the start, Endless Forms Most Beautiful is another fine Nightwish effort, all that you would expect from the band: intriguing, entertaining, and satisfying symphonic heavy power metal. Always recommended. Endless Forms Most Beautiful is another fine Nightwish effort, all that you would expect from the band: intriguing, entertaining, and satisfying symphonic heavy power metal. Always recommended.